First Resource Bank president and CEO Glenn Marshall with Immaculata University students Alexander Noel, Nicholas Boule, Connor Lindsay and their professor, Dr. Elizabeth Faunce, on the university’s campus in Immaculata, Pa. 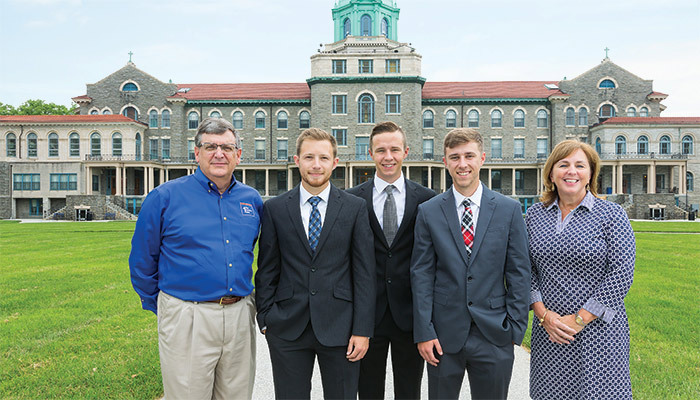 When four students at Immaculata University in Pennsylvania partnered with bank president and CEO Glenn Marshall in a national competition, the whole team won. Like so many community banks around the country, First Resource Bank in Exton, Pa., has built a reputation of going above and beyond to help its neighbors. During the Great Recession, the bank helped troubled businesses recover. Today, it supports children, veterans’ groups, seniors and many others through a variety of programs. Now college students are on that list, too. It began in the spring of 2018, when Dr. Elizabeth Faunce, an associate professor and advisor at nearby Immaculata University, asked First Resource Bank president and CEO Glenn Marshall to partner with four undergrad students to compete in a nationwide academic competition. Marshall didn’t hesitate. “I said, ‘It sounds like fun,’ and jumped in,” he recalls. Marshall several times. “He was always available when we needed him,” says team leader Connor Lindsay, an upcoming junior and accounting major at Immaculata. What did the students learn about the bank? “The most important thing about this bank is the fact that it claims to be a high-tech, high-touch bank, and we support in our paper that it is both of those [things],” Lindsay says. Take FRed (First Resource Easy Deposit), for instance. It’s a bank-issued remote deposit capture machine that scans and electronically deposits checks. The $260 million-asset bank provides this device to about 160 business customers for free. So instead of the office manager running to the bank to deposit checks, the machine can scan them within seconds at the office. FRan arranges training sessions for customers to explain to bankers what they do and who they’d like to connect with in the community, and offers a free meeting space with complimentary Wi-Fi and beverages. Marshall hoped the students would become aware of an industry that helps communities and provides a fun and satisfying career path. And Faunce wanted her students to go beyond the one college class they take in money and banking. “In our finance classes … we don’t have a lot of banking exposure, so I thought this was a really good experience for our students,” she says.